Esdale Samuel Joseph Died Suddenly 5th November 2018. Late of Cairo Street/Ormeau Road, Belfast and 9th BB Old Boys. Funeral service will be held on Friday 9th November in Shields Funeral Home, 25 High Street, Donaghadee at 1pm followed by burial in Ballyvester Cemetery. 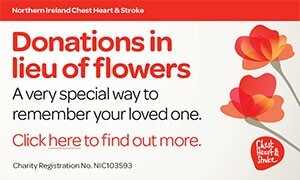 Family flowers only please, donations in lieu if desired payable to British Red Cross (NI), 12 Heron Road, Sydenham Business Park, Belfast, BT3 9LE. He will be sadly missed and lovingly remembered by his family and friends. In loving memory, from his friends Leonard and June Haddock. Esdale, Samuel Joseph, Died suddenly 5th November 2018 late of Killaughey Road Donaghadee. The Members of Donaghadee Bowling Club deeply regret the death of their esteemed member Samuel. I am sorry to tell you that Samuel Joseph Esdale has passed away.